These are nicely made tools with features that work in the real world. I am almost ashamed to admit that while I have owned sufficient quantities of Craftsman and Snap-On hand tools over the years to be recognized in a crowd by shareholders this is my first GearWrench PASS-THRU™ SAE/Metric Socket Set. Actually it’s my first GearWrench tools of any kind. After thrashing this set in my shop for this review I can say that these are not likely to be my last GearWrench tools. The GearWrench PASS-THRU™ SAE/Metric Socket Set (#891226, ½”-drive) reviewed here comes with the locking flex GearRachet, a 6” Vortex™ extension, twelve metric Vortex™ sockets from 15 mm through 32 mm, ten SAE Vortex™ sockets from 5/8” through 1-1/4”, a ½”-drive Vortex™ Quick Release socket adapter and the fitted carry case. The key part of this tool design quite literally revolves around the PASS-THRU™ feature. Working much like a ratcheting box wrench the interchanging open sockets and use-focused design of the ratchet handle make this GearWrench PASS-THRU™ SAE/Metric Socket Set easy to use in many situations. 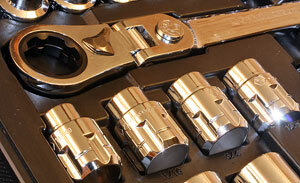 Because the bolt or stud protrudes through the standard length sockets we don’t need the deep well versions. Even the socket extension is hollow! All of the GearWrench PASS-THRU™ components appear to be nicely forged with solid amounts of steel in the walls of the sockets. This is unlike the overly thin walls of the cheap sockets that should have you fearing that little snap sound as you try to tighten or break a fastener loose. By keeping the ratchet itself so much closer to the fastener centerline we also loose the wrap-up that can be found in many deep well sockets and solid bar extensions. 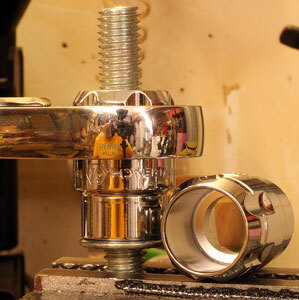 The Vortex drive system (left) is a solid connection between the sockets and ratchet that puts the force you apply closer to the centerline of the fastener itself. The PASS-THRU sockets and wrench (right) let you do more with less tools. I can also tell you that this PASS-THRU idea can save the day when working on lots of vehicles and machines. Overall the GearWrench PASS-THRU™ SAE/Metric Socket Set tools are nicely finished with first-rate chroming and ultra-smooth surfaces. The shape and smoothness of the grip areas make these very comfortable tools to use especially on jobs that run longer than expected. The rubber-like inserts built into the ratchet handle are a case in point. 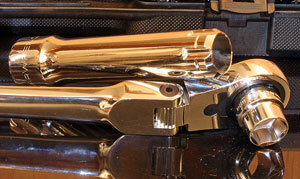 The inserts add a softer feeling but also enhance the grip of a bare or gloved hand. To enable the PASS-THRU™ system GearWrench had to come up with a solid way of transmitting ratchet forces to the sockets themselves. Enter their Vortex™ drive that solves all of those problems in a compact but super tough way. One of the things I like about the Vortex™ is that they chose to go with heavy, spline-like shapes rather than a finer design. I have some experience with this kind of drive from my racing days where this heavy-lug style drive was favored in places like axle drives because of its brute durability. When applying large amounts of torque the heavy lugs just live longer and show less wear. Since many of us have drawers full of the more traditional square drive sockets GearWrench adds a ½” square drive adapter to the #891226 set reviewed here. This adapter has the Vortex™ drive and fits the GearWrench Ratchet but also has the familiar push-button quick release to match up with most existing ½” square drive sockets. To further enhance the usefulness of the GearWrench PASS-THRU™ SAE/Metric Socket Set a low profile, indexing flex head ratchet is included. Despite housing the full height of the Vortex™ drive system the body of the ratchet is only 7/16”-thick. 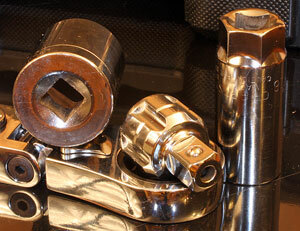 The overall width of the ratchet head is only 1-3/4”. All that means that combined with the PASS-THRU™ feature and a trim 5-degree minimum ratcheting arc this tool will work in smaller places than we might expect. Even the 6"-long extension (left) is hollow and while it took me a little while to get that through my head, it works great. GearWrench includes this 1/2"-square drive Quick Release adapter (right) that lets you snap on all of your old square drive components. The 12”-long handle provides a bunch of leverage to make tightening and loosening fasteners less of a test of strength event. The head pivots on the handle up to 90-degrees in either direction with that movement controlled by a single push-button release at the joint. Using the GearWrench PASS-THRU™ SAE/Metric Socket Set demonstrated to me that the PASS-THRU™ design does not add any kind of “softness” to the feel of these tools when you bear down on a tight fastener. I wondered about how well the walls of the PASS-THRU™ sockets and extension would handle that kind of strain. In every situation I could come up with during the evaluation I never felt anything that even suggested distortion or flex in the GearWrench PASS-THRU™ SAE/Metric Socket Set components. If anything the PASS-THRU™ design seems to apply the force we apply on the ratchet handle more directly to the centerline of the fastener being tightened or loosened. The relatively small size of the ratchet head along with the small 5-degree swing to engage the next ratchet tooth lets you be more efficient when working in confined areas. Being able to angle the ratchet head enhances that efficiency in many situations because you can work around nearby obstacles. I also like that the head locks at those angles because that lets you focus on pulling or pushing the ratchet safely without trying to maintain the angle at the same time. The connection between the ratchet, extension and sockets is physically very strong but easy to engage. Everything clicks right into place and separates just as easily when you are done. This shows the consistency of accurate manufacturing along with a solid overall design of the drive system. If you are like me, there is a cabinet with lots of hand tools from other manufacturers lurking in your shop. The included ½” Quick Release adapter means that you can continue to use any of those pieces with the GearWrench PASS-THRU™ SAE/Metric Socket Set. I have several special spark plug sockets and other attachments that do not need the PASS-THRU™ design but it is nice being able to put them on the GearWrench PASS-THRU™ ratchet. The GearWrench PASS-THRU™ SAE/Metric Socket Set is a well-made set of tools made even better by the PASS-THRU™ feature. For many users that lets you keep a smaller set of tools without losing capability. There are few situations where the PASS-THRU™ design is going to be a problem. The overall quality of the GearWrench PASS-THRU™ SAE/Metric Socket Set tools and the fitted case promise a very long life with common sense care by the user. You don’t have to pamper these tools but rather just try to not get stupid with them. 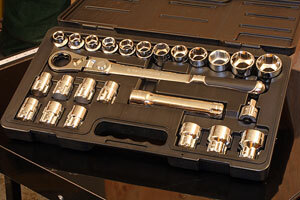 The GearWrench PASS-THRU™ SAE/Metric Socket Set #381226 shown in this review has a street price of around $130.00 (5-14-2012) so this is not a budget breaker. When it comes to long-lasting hand tools this seems like a very good value whether you are a pro or a homeowner/DIY type that just appreciates buying good tools the first time. If your selection of hand tools has been leaving you frustrated and under equipped, check out the GearWrench PASS-THRU™ SAE/Metric Socket Set. There is a lot of capability within this set to help you get the job done right in less time.